Christmas bells are ringing around and all of us are way too excited for the coming year. As virtual assistants have become a part of our daily life, we even want them to be a part of our holidays. When the Christmas celebrations are calling out, you can check some of the best Alexa skills for Christmas. Here are some fun things that you can do with your Alexa for enhancing the festive spirit among your family members and friends. Wondering, what Alexa can do for making your Christmas celebrations more lively and fun-loving? Well, explore this list of varied and best Alexa skills for Christmas. Engulf into the Christmas celebrations this year with amazing Christmas screensavers. A video with beautiful holiday images slides continuously for an hour and all this is specifically designed for your Amazon Echo Show. You can even stop the slideshow whenever you want by asking Alexa to “go home”. It just offers a perfect ambiance whether you are decorating, crafting, or cooking delicious dishes. One thing that must be taken into consideration here is that this Alexa skill is not for non-screen Alexa devices. How can a festival be without music? If you want to stream music related to holidays and Christmas, it can now be done with the Christmas Radio. What you require to do is enable Christmas Radio skill and ask your Alexa to fire it up. It will make you listen the best-ever jingles and your favorite holiday as well as Christmas music. This skill of Alexa comprises of dynamic content. Want to refresh your childhood memories this Christmas? Enable the Christmas Sounds skills of your Alexa and create a warm and comfy atmosphere wherever you are – be it in your house or a café. Sit together with your family, remember the sounds and music that livens up your childhood and have an unforgettable time. You just have to say “Alexa, play Christmas Sounds” and you will hear the best carols. When you want the sounds to stop, say “Alexa, stop”. Christmas is the festival that symbolizes kindness. Celebrate this Christmas by doing kind deeds. Wondering, what would be they? Let your Alexa help you with it. Enable Christmas Kindness Alexa skill and it will provide you with an act of kindness on daily basis. Start your day by asking “Alexa, open Christmas Kindness” and Alexa will randomly give you an idea about integrating kindness in your day. Fill this festive season by being kind to others. Every celebration is incomplete without music – be it festivals or parties. Enjoy your festive holidays to the fullest with Alexa’s Classical Christmas skill. What will this Alexa skill do for you? Well, it functions just like any other audio device that plays, pauses, skips, and stops classical music with the help of your voice. It also remembers from where it stopped or paused and resumes from that point. The best part about Christmas is getting gifts from Santa. Isn’t it? Yeah, I can see your heads nodding in agreement! This beautiful skill of Alexa provides you a record of Santa’s movement. It acknowledges you about how many days are left until Santa will begin his journey. You can even follow him right from where he starts his journey and hear his location as this skill will track him across the globe on 24th December. Get to know some facts from the Top-Secret Santa files. Though only the Santa knows when he would arrive, we can just say that he will arrive when children are asleep. Excited to know more about the best Alexa skills for Christmas? Then, here is your Santa Claus for this Christmas. Santa Claus is already making a list and checking it multiple times. You can ask Santa about some secrets and he is there to reply you. Suppose, say “Alexa, ask Santa Claus if I’m naughty or nice”. 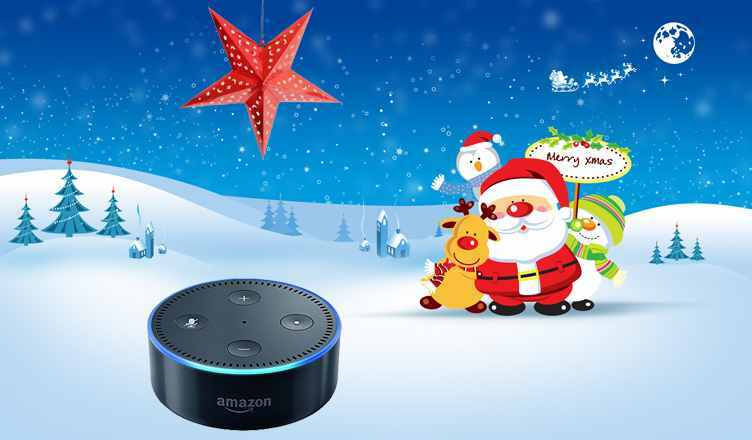 This skill of Alexa will provide you your answer with the help of Santa Claus. Have fun this Christmas with this skill of Alexa. Christmas is all about merrymaking and spreading joy. Have a light and cheerful atmosphere while spending your Christmas Eve with friends and family members. Enable Alexa’s Christmas Jokes skill and have fun. To activate this skill, you will have to say “Alexa, ask Christmas joke to tell me a Christmas joke”. You can even activate it by saying “Alexa, open Christmas Joke”. Have some questions to ask your Santa? Waiting for the Santa but fell asleep before it arrived? No worries. You can ask all the questions you have to Father Christmas with the Alexa skill ‘Ask Father Christmas’. It allows you to ask about 100 questions and Alexa will answer them all for you. Some random things that you can ask are “Alexa, launch Father Christmas” and it will open the app for you. “Alexa, ask Father Christmas for help” and it will provide you a list of sample questions. There are more fun-loving things that you can ask with this Alexa skill. Want to spend your Christmas holidays doing something new? Well, Alexa’s new skill – Christmas Song Quiz – can help you do something interesting for you and your family. Do you think you are a Carol master who knows all the carols very well? Then, step right now and test your knowledge for fun. Alexa will read some lines from the Christmas songs and will ask you to guess the song title or might even ask you to complete the lines. Aren’t these some of the best Alexa skills for Christmas? So, what special have you decided to do with your Alexa this Christmas? Do write to us if you have come up with some new celebration ideas this Christmas in the comments section.